On February 8, 2008, I took the oral qualifying exam in materials science and engineering (MSE). It's a tradition for the testees to write up their experiences and advice for the benefit of future classes. Some context: questions can come from the four core classes that all MSE students at MIT take (thermodynamics, kinetics, electronics, and mechanics) and also from two elective classes that pertain to one's focus (in my case, mechanics of materials). Interstitial sites in face-centered-cubic (FCC) crystals. Definitions: At various times during practice sessions, my colleagues and I found ourselves unable to define simple terms like Poisson’s ratio, density of states, mobility, ceramic, Gibbs’ phase rule, and others. Review these, because you do not want this to happen to you. As my advisor told me, the panel wants to lead you to the edge of your knowledge; what does it tell them if you’re clueless at the beginning? Pictures: A good sketch proves that you’re familiar with a concept and gives you something to stare at when you get lost. I made sure I could sketch edge and screw dislocations, phase diagrams, stress-strain curves, crystal structures, yield surfaces, pair potentials, and so on, quickly and correctly. Exploit your sketches for maximum usefulness; a pair potential can be used to explain trends in stiffness, density, thermal expansion, vacancy formation energy, melting temperature, vapor pressure, and heat capacity! Mini-lectures: I prepared something like twenty or thirty mini-lectures on concepts like nucleation, growth, spinodal decomposition, diffusion, strengthening, fracture, fatigue, creep, elasticity, and phase diagrams. (You can rehearse these in the shower.) Prof. Sam Allen has wisely noted that if you can “teach” a concept to your panel, you are both impressing them and running out the clock! But be sure of everything you say, or you’ll regret it when they challenge you. Material properties: While it’s overkill to memorize tables of values, it would be pretty embarrassing to not know the stress-strain curves of brittle, ductile polycrystalline, and ductile monocrystalline materials; the Young’s modulus of a few metals, ceramics, and polymers; a couple of crystal structures (with slip systems and interstitial locations); the layout of the periodic table; and so on. So learn these. Drill, drill, drill: As many have emphasized, there is no substitute for standing at a board as a colleague (better, your advisor) mercilessly questions you. My advisor quizzed me aggressively so I wouldn’t be taken aback by anything my panel might say. It worked. The day: I scouted out the room early and went back to my office to get better dry erase markers. My electives were 3.40 (physical metallurgy) and 3.53 (electrochemistry), and my panel consisted of Profs. Chris Schuh, David Roylance, and Randy Kirchain. Roylance began by inviting me to relax, be confident, and ask for clarification on any question if I wished. He said that in the first part of the exam each professor would take about 15-20 minutes to question me. I would then be asked to leave the room so they could discuss which areas to explore deeper. He added that occasionally there is no second part, but it’s not a guarantee that the candidate has passed; you have to wait until everyone has taken the exam before you learn your result. It seemed that none of the panel members wished to ask an electrochemistry question. They had my transcript and saw that I had taken 3.57 (economics of materials) a couple of years ago (as part of the MEng program). Kirchain asked if I was comfortable answering 3.57 questions and I said yes, that I had reviewed the material in case this very situation occurred. I couldn’t help but feel a little relieved; I figured if I did poorly with the 3.57 questions the obvious defense would be that I didn’t pick it as an elective anyway. OK, explain them. (I drew an edge dislocation. A solid solution results in a solute atom that’s the wrong size for the crystal, causing misfit. Energy is lower when a too-large atom sits in the tensile stress field under an edge dislocation. Dislocation movement then requires solute diffusion.) Does it have to diffuse? (No, the dislocation can pull away from the solute atom, but then the energy goes up.) Be more specific about the energy. (The strain energy.) 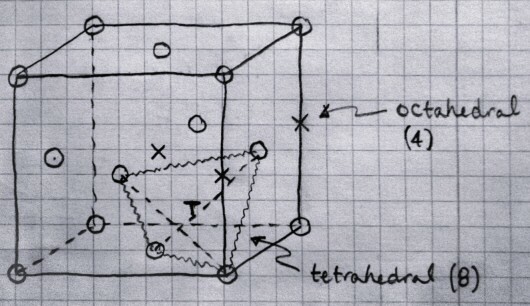 OK.
How would you achieve solid solution strengthening at a composition within the two-phase region? (Quench from the single-phase region so that the nucleation of β is kinetically limited.) What’s the largest composition at which this is possible? (There must be a maximum because dissolved B will strengthen α on the left side and dissolved A will strengthen β on the right side.) Right, so? (Eutectic?) There’s no single-phase region near there. (Whoops, top of solidus.) In theory, but the region comes to a point there. In practice, uncertainty in temperature measurement limits you to a composition slightly less than that. Now explain precipitation strengthening. (Quench as before, but then heat up to nucleate many small β particles. A dislocation can glide over to the precipitate but will stop there because it’s unlikely a favorable slip plane will be offered.) What if it’s a coherent precipitate? (Ummm…) The slip plane is the same, so you won’t have that problem. (I realized he wanted me to talk about cutting. If the dislocation cuts through the precipitate, the surface area and energy increase.) OK. Draw another eutectic system for components A and C where the solubility of C in A is lower than B in A. (OK.) Are the strengthening mechanisms you described easier or harder to achieve? (At this point, I got flustered because I couldn’t even remember my own earlier descriptions! After an uncomfortable silence I half-guessed that it would be harder.) Right, the solubility region is smaller so it’s harder to achieve the same effect. I’m done. Schuh took the approach I was expecting, where the questioner cuts you off (politely) when he or she sees you know something and moves on to something else. Because each candidate (regardless of ability) is taken to his or her limits, the oral exam is consistently unpleasant for everyone. Define engineering stress and strain. (Force over area.) Any area? (Original area. And engineering strain is change in length over original length.) Compare true and engineering stress-strain curves. (I drew these. The true stress-strain curve never decreases from necking.) Good. The polyethylene used in a six-pack necks, but that’s not where it fails. If you pull harder, the neck will just extend along its length. Why would this happen? (A strain hardening effect.) Right, why? (In another long exchange, he helped me to get to the answer: during necking, the chains reorient from a spherically oriented, or spherulitic, morphology into an orientation in which primary covalent bonds line up with the applied force, leading to strengthening.) I’m done. You should try the experiment with a six-pack sometime, it’s neat. By now I was fairly frazzled from the questioning. Fortunately, Kirchain’s segment was even more like a back-and-forth discussion than the others. Using some MEMS processes as models, he checked that I knew how to construct a cost model, what a figure of merit was and how to use it to evaluate various materials on an Ashby chart (including a non-unity slope for nonlinear figures of merit), and what fixed and variable costs were. With the more relaxed format, I found myself babbling a bit. Finally, Kirchain was satisfied and turned the floor back over to Roylance, who asked me to step outside so the panel could discuss what to cover next. Final thoughts: Try not to make your panel uncomfortable with excessive nervousness (either long silences or incessant talking); it makes them think you’re not ready to pass. Just like giving a talk to a group, try to turn the inevitable nervousness into enthusiasm. Very important: “I don’t know” is allowed and usually results in the pressure being removed. Overall, I was satisfied with my preparation method; if I hadn’t known how to draw a eutectic phase diagram, explain strengthening mechanisms in metals, or draw the stress-strain curve for a typical thermoplastic, the exam would have been over as soon as it began. 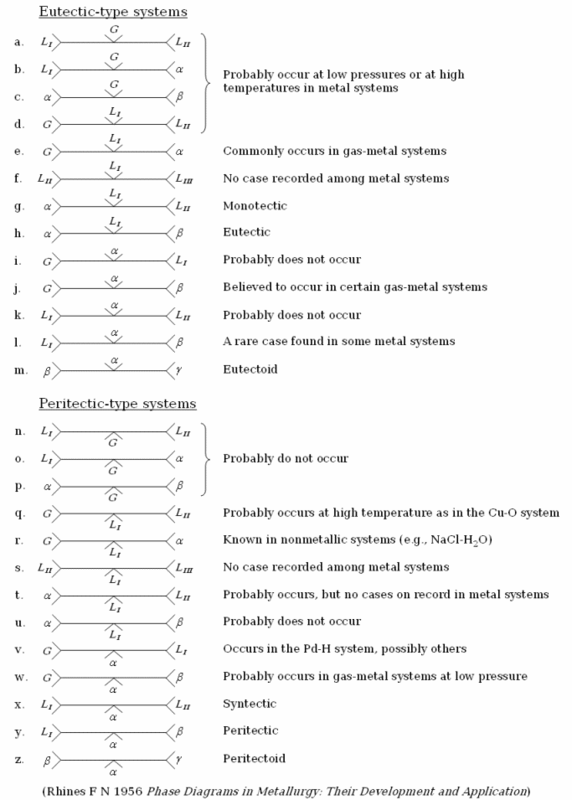 All phase permutations of invariant points for constant-pressure phase diagrams.